Create email marketing that gets read—and gets results. What makes the perfect email newsletter? It’s an email that gets delivered, opened, and read—then initiates action from the reader. Here’s how to achieve real results from your email marketing. Read our How to Design the Perfect Email Newsletter Guide. Keep attachment sizes below 10mb. If you use Constant Contact, we’ll host the attachments for you. Don’t use a single image as the body of your email. That’s a common tactic used by spammers. Include a link to unsubscribe. It’s the law—and it’s automatically added to all Constant Contact emails. Use a ‘from’ name and email address customers will recognize, like your name and business name. Keep subject lines compelling and concise—ideally 50 characters, or less for mobile devices with short cutoffs. Write 5-8 words of preheader text that appears below the subject line in mobile inboxes. Ready to get your emails opened? Pick a template that works well on a mobile device. Constant Contact offers a range of mobile-responsive options. Put your logo at the top of your message. Branding your email ensures your business stands out in a crowded inbox. Keep it simple and professional. Too many fonts and colors will make your email hard to read. Ready to get your emails read? Choose images carefully. A recent analysis shows that emails with 1-3 images see the highest click-through rates. Keep your email copy clear, crisp, and scannable. Most customers don’t read emails word for word. Use one primary call to action and put it near the top of the email. Don’t force your customers to scroll for that next step. Ready to get your readers to act? Want more tips on getting the most out of your email marketing? 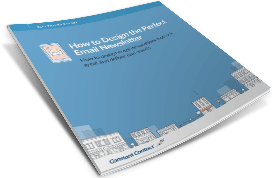 Sign up for Constant Contact’s email newsletter now and receive our How to Design the Perfect Email Newsletter Guide. reach out to you with future communications.